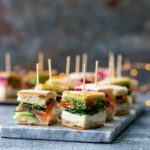 These French pressed sandwich bites have 3 different flavour varieties in one loaf! A party food that's a little bit different, but still super easy to prepare. Slice the top off a ciabatta loaf, then hollow it out (I use a knife to cut around the inside, then scoop it out with my hand). Try to get as much of the bread out as possible (save the bread to make breadcrumbs for another dish). Spread the base of the ciabatta with cream cheese. Cover 1/3 of the base with cucumber, 1/3 with baby spinach leaves and 1/3 with grated carrot. Top the cucumber with the salmon, top the spinach with the red onion and top the carrot with the radish slices. Top the salmon with the mizuna leaves, the red onion with the roasted peppers and the radish with the hummus. For the final layer, top the mizuna leaves with the lemon zest, the roasted peppers with the pesto, and the hummus with the grated beetroot. Wrap the ciabatta in baking parchment and place in the refrigerator. Place a baking tray on top with a heavy weight (I used a heavy pestle and mortar - but make sure your fridge shelf can hold the weight! ), and leave for a few hours or ideally overnight. Unwrap the ciabatta and chop into thirds. Chop each of the thirds into 9 (3-by-3) sandwich bites. So altogether you should have 27 sandwich bites. Place on a plate to serve (stick a cocktail stick in each one to make them easier to pick up if you like). Yes, so long as you have a good thick layer of cream cheese, and you're using really fresh ciabatta, you can make this 2 days ahead, then wrap and refrigerate. So far I haven't found a decent, thick gluten free ciabatta. If you know of one, let me know and I'll add it to this post. Warburtons do a pretty good gluten free sourdough cob that would work for this though. If you're using a cob, you'll be better off slicing into wedges. The wedges will probably be bigger than the bites, so it will serve fewer people. The cream cheese acts as a barrier to prevent the bread getting soggy. You could use a spreading of butter or some thinly sliced cheese instead. Nutritional Information is approx. (worked out as a whole and divided by 27 bites) per sandwich bite.